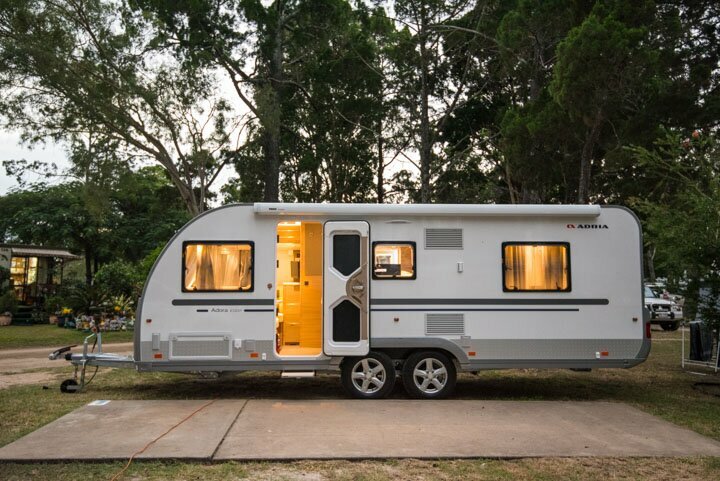 While we were showing off a bunch of vintage caravans at the recent Sydney Caravan Camping Holiday Show, some friends of mine came past and asked if they should buy an Adria. I quizzed them briefly about what they wanted to do. They’ve got a smaller four-wheel drive with a lower towing capacity, aren’t going off-road and want to be comfortable. An Adria Adora is perfect for that, and unhesitatingly I said ‘go for it’. Take this Adria Adora 612 as an example. It’s a 22-foot caravan that weighs just 1650kg empty or 2000kg full. Those are incredible numbers – the sort you saw on caravans of the 1960s and 70s. For comparison, the Jayco Silverline 21.65.3 (21 foot) is 2580kg before a load, while the Jayco Journey 22.68.1 is 2280kg empty. Neither of these caravans are fitted with significantly better features (in fact, the Journey is more basic), and even accounting for the Silverline’s slide-out section, 900kg is a lot of extra weight. The result is a caravan that’s incredibly easy to tow. You might find this hard to believe, but cars that can tow this Adria 22-footer include the Nissan X-Trail diesel, Renault Koleos diesel (it’s the same car as an X-Trail), Mitsubishi Outlander, the all new Holden Commodore, Hyundai Santa Fe, Toyota Kluger and Volkswagen Tiguan. Even the tiny Kia Sportage scrapes in, if you don’t need to use the whole of the van’s capacity. With any of the modern dual cabs or something more substantial like a LandCruiser, there’s almost nothing to it. I towed it about 700 kilometres from Brisbane to Woodgate Beach and back. In that time it didn’t sway, didn’t slow me down on hills and didn’t lurch around on rougher back-roads. It is braked mechanically, though, which is typical of all European built caravans. It provides a different sensation to electric braking, as there’s a slight delay as the braking mechanism compresses before activating the brakes entirely. It never failed to slow down, though. It’s a good-looking caravan, too, with its clean lines, large front windows and respectable ground clearance. The body is a collection of large, single-piece panels stuck together with expensively engineered aluminium extrusions. Adria is very confident it’s good, because it offers a 10-year warranty on water ingress. It rides on an AL-KO chassis, which is hot-dip galvanised, with AL-KO independent rubber suspension on both axles and AL-KO’s anti-sway coupling, which has a small brake pad inside it which clamps on the ball creating a bit of resistance to sway. Apart from the jockey wheel, there’s nothing else on the a-frame. Both 4.5kg gas bottles are fitted inside the front boot, which makes it very clean and neat at the front. 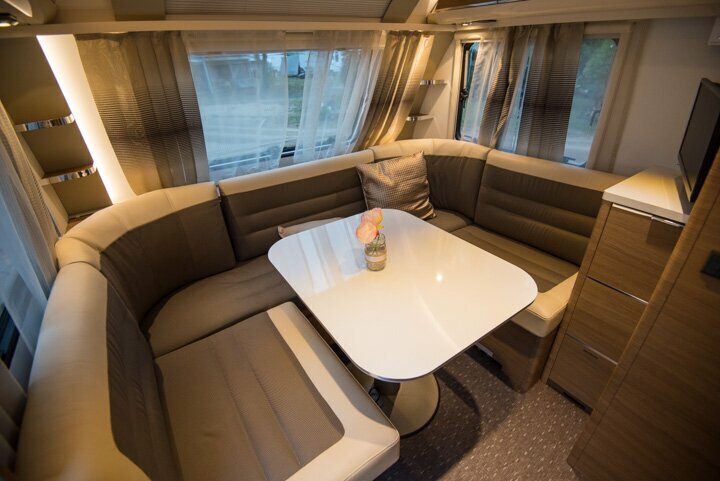 Adria is very good at interior design and developing good floorplans, and there’s little to complain about in the Adria Adora 612. 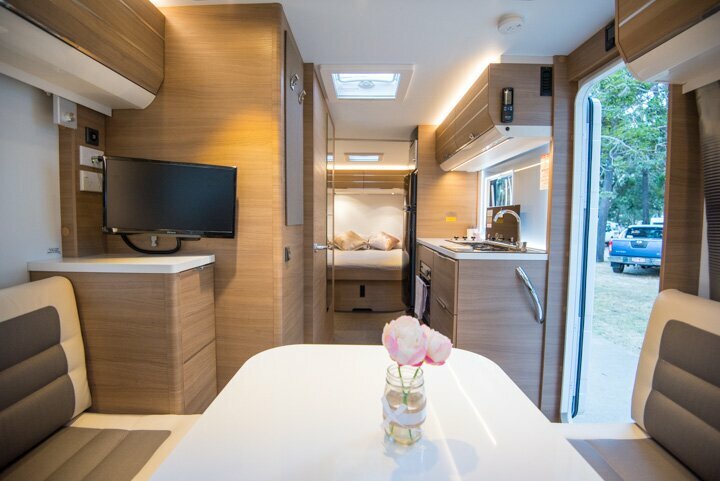 Very reminiscent of motorhomes, it’s also nice not to have to write about a caravan with an island bed forward and a full-width ensuite at the back. 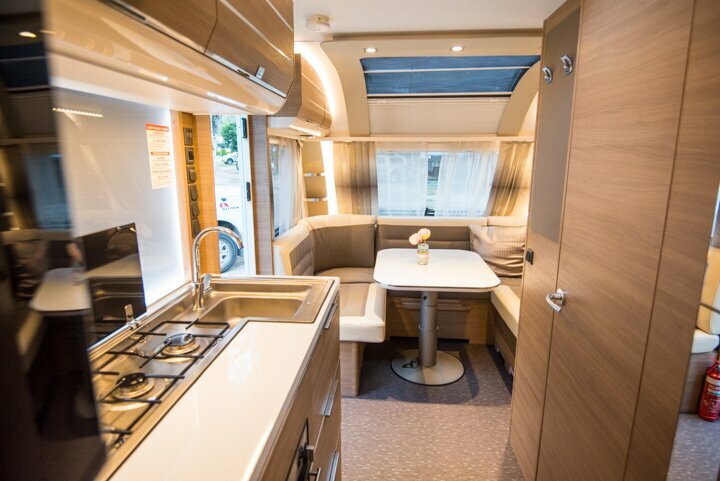 This floorplan is actually very reminiscent of a motorhome, because the bed is at the back, the ensuite is down the side, opposite the kitchen and the dinette is at the front. It’s almost like a weird caravan Bizarro World. The wrap-around front lounge is very comfortable (it’s where I’ve been sitting to write this review) and probably my favourite place in the caravan. There’s a large table which can be lowered to create a bed base. It’s not fastened to anything, either, so it can be easily moved around to let people in or out. It does move a little while under tow, but the large, grippy base prevents it going too far. All of the caravan’s entertainment is here, too, including the 19in telly, the Adria RV media unit and the big windows you can look out if there’s nothing on the box. Because the ensuite runs down the side of the caravan, rather than the traditional spot at the rear, it feels a bit narrow through the kitchen, even if that’s not quite the reality – were there a dinette opposite the kitchen, there would be just as much space, the only difference is there’d be a window to look out. It’s a good kitchen, though, with Thetford’s reasonably new three-burner stove and sink combination. There’s a Thetford oven underneath, two large drawers for storage, a slide-out pantry rack and two overhead cupboards. The fridge, from Thetford, is 190-litres in capacity and has a two-speed fan to keep the heat exchange as efficient as possible, even in hot weather. There’s a microwave, but no range hood – Adria advises you to just open a window. To the rear, the island queen bed has heaps of room around it and plenty of lighting. The bed base is hinged in the middle, so can be lifted from either side. In that cavernous storage area is the condenser unit for the Truma Saphir Comfort ducted reverse cycle air-conditioner unit. These are great, and even under the bed, aren’t so noisy that I find it keeps me awake. The memory foam mattress is firm but comfortable, too, which certainly helps. There are also two tall wardrobes around the bed, a couple of drawers each side and two overhead cabinets for extra storage. I haven’t mentioned the ensuite much yet, because somehow the door has locked itself closed from the inside. It seems that the handle wont unlatch the bottom catch (there are three on the door for some complicated reason), so the door has stayed shut. When I peek through the crack of door I can see through, I spy a neat looking area with a good-sized shower cubicle and stainless-steel fittings. It’s probably very nice, but I have to shower in the amenities block this trip. 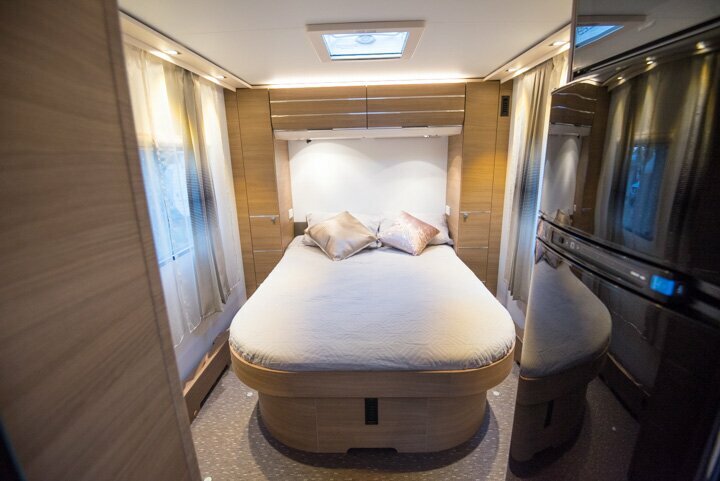 The Adria does present itself very well inside. There’s a style and class to it that is so typical of European design that I can almost take it for granted in a caravan like this, but it shouldn’t be. It’s genuinely good looking and comfortable to be in. 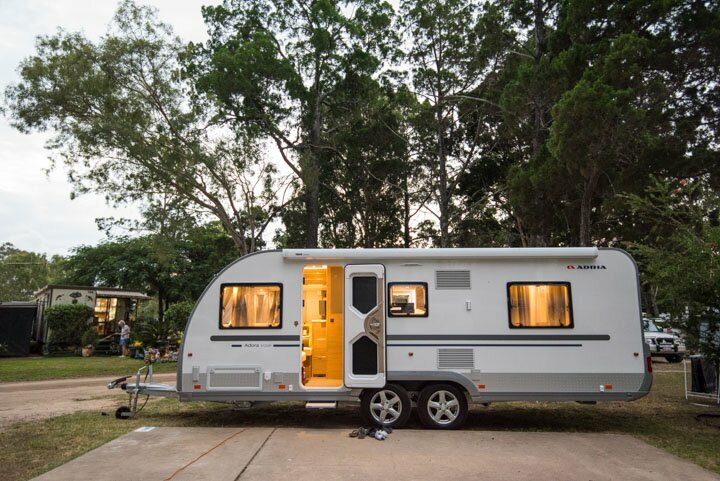 Even the lighting is nice – a warm orange rather than the harsh blue of many modern LED-lit caravans. Other comforts include a Truma Combi gas electric room-and-water heater, plus a wind-out awning for shade and shelter. There’s also an external TV point, manual slide-out step and large boot door to give access to some of the under-lounge storage space. Ensuite door frustrations aside, it’s hard not to like this caravan. It’s light but strong, comfortable and stylish and tows very well for such a long unit. 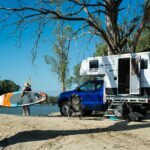 Euro vans have been in Australia long enough now to prove they can cope with Aussie roads… and shaving nearly a tonne of weight off the back of your car is never going to be a bad thing. The only thing left is the price. 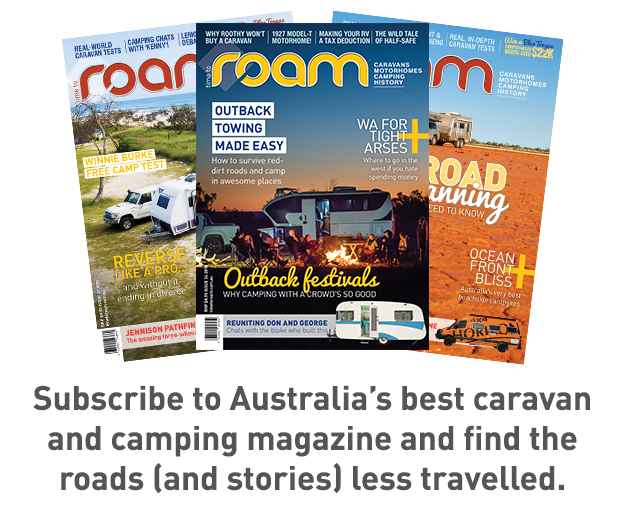 When I pulled into the caravan park (after nailing the reverse onto my site, might I add), a bloke wandered over to ask some questions. One was “How much?” I didn’t know at the time, but guessed it was around $65,000. Turns out I was a bit wide of the mark – it’s actually only $59,990. That’s not bad at all for a full-featured caravan that’ll only continue to save you money down the road on fuel.